What a strange journey pirates have had in the media in the last fifteen yarrrrs. A few decades ago, pirates had become laughable, a bad idea that no one wanted to see. Films like Cutthroat Island cemented that opinion. Then, slowly, they started making a comeback. Wonderfully ludicrous things like International Talk Like a Pirate day (September 19th) helped pave the way, and a certain movie series based on an amusement park ride have helped put pirates right back on the entertainment map. They are played more for comic adventure than high-seas drama, but sometimes you need a good swashbuckling. 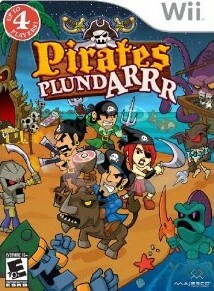 Majesco has stepped up to fill that void on the Wii, releasing the appropriately named Pirates Plundarrr. Hoist the mainsail, me hearties, let’s review. Let me put this right out there-if you are looking for an epic story full of twists and betrayals, you’ve come to the wrong place. Pirates Plundarrr gets all of the betrayal out of the way in the first act of the game, before you’ve even swung a cutlass. It seems that Cap’n Rudebelly, a former friend of yours, has cheated you out of the Scepter of Power. It’s time to grab the crew and chase down his cheating hide, with an eye towards making him walk the plank. Pirates Plundarrr is a series of mostly side-scrolling areas that you will be chasing Rudebelly through, fighting off the monsters he raises with the Scepter. Once you have made some progress, you will open up your ship as a location so that you can swap weapons and outfits, and also duel other players. 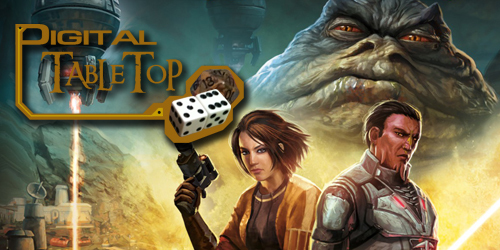 A large part of the fun in this game is the four-player local co-op. You can’t take it online even though that would have been great, but it doesn’t hurt to have friends over on the couch. There are four pirates to choose from, each with a different specialty, and all of them can be customized as you level up by fighting. 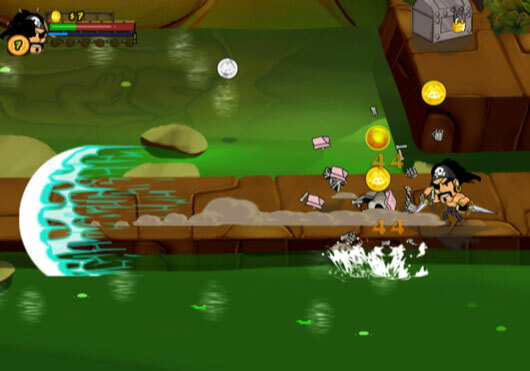 People who played Castle Crashers should feel right at home, and the game hearkens back to the massive, four player arcade consoles like The Simpsons or Teenage Mutant Ninja Turtles. Pirates Plundarrr features a simple story, but the co-op play is so fun and accessible that you won’t find yourself missing anything more complicated. Smooth animation, good shadows, and a lot of solid colors characterize the graphics in Pirates Plundarrr. There’s some slowdown early on when levels load, almost as if it seems the game hadn’t finished loading when action starts. Aside from that minor issue, the graphics are impressive across the board. There are a lot of cute touches as well, like skeletons wearing bathing suits and beach towels. Animation during combat is pretty much flawless, with lots of damage effects like bones flying through the air and enemies becoming inflamed when struck with fiery weapons. If you ignore the little bit of slowdown at the start of a few levels, you’ll find a game that runs as seamlessly as anything, even while animating dozens of skeletal bits being knocked all over the screen. 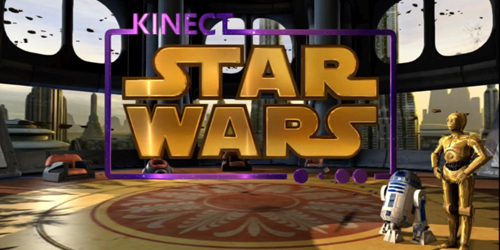 The classic arcade-style animation with cell-shaded characters works very, very well for this title. I was kind of disappointed with the sound in this game. It isn’t bad by any stretch, but I feel like a few things were left out. 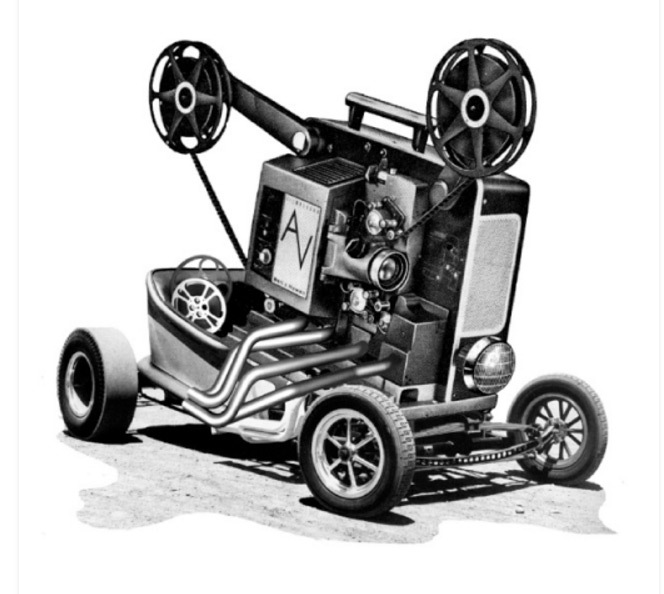 The effects are good, and the music is fine and occasionally brings to mind old sea chanteys like “What Do You Do With a Drunken Sailor.”Â The problem I have with the sound is the lack of voices. Aside from a few chuckles by Rudebelly, there just isn’t enough voice here. All the characters have special attacks, and it would be so simple to have them yell something appropriately piratical at the time they use them. The Pirate Wench could yell “Avast!”Â or the Duelist could yell “Yarrr!”Â It is kind of sad that this isn’t in the game. Sure, you can feel free to make the yells yourself, but I’d have liked to have those exclamations in the game. Still, the lack of extra sounds doesn’t cripple the game, it just takes it down a few pegs. Simplicity can be a great thing. Since Pirates Plundarrr is a game intended for just about everyone that can pick up a controller, the controls aren’t much more than basic button mashing. However, like many of the best brawler games, there is hidden depth here. The lion’s share of the control is based around jumping, attacking, and moving with the directional pad. 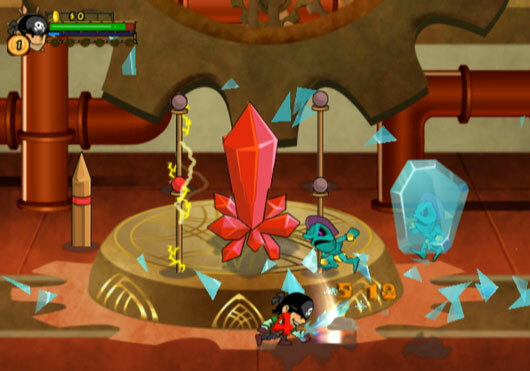 There’s also a refreshing lack of waggle controls just because they could do it. 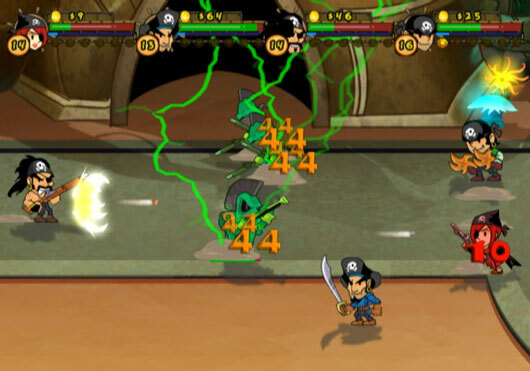 There is a super attack that each pirate can use that is triggered by shaking the controller, but that’s it. This title does turn into a button masher at times, especially before you start unlocking the charge attacks that each character features. Once those are available, more enemy management and grouping techniques come to play. Pirates Plundarrr starts out as a game of the lowest common denominator, and can certainly be played like one, but the more you play the deeper the game gets. A level system that lets you increase your proficiency with the various types of weapons adds to this. If you’ve been maximizing your skill with swords, but then an awesome axe comes along, you’ll have some choices to make. There are a lot of things you can unlock in Pirates Plundarrr, but not much need for multiple play-through. 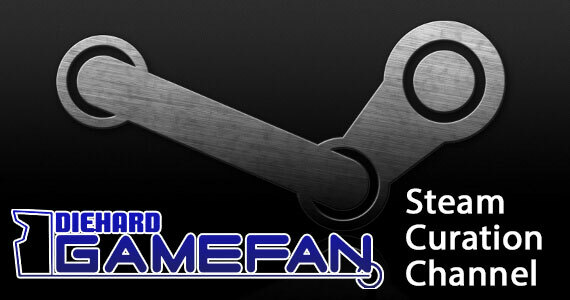 Most of the things you will find that are unlockable are awards for beating levels or bosses. These awards are usually more powerful weapons, but there are also a series of costumes for your character. The faces never change, but the outfits can be altered to become the body of most of the enemies. 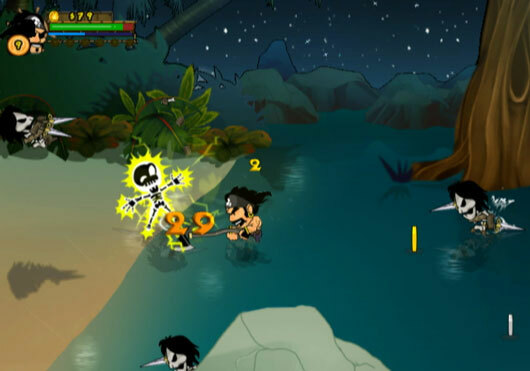 You can play the game as a skeleton, a tribal warrior, Amazonian princess, or more. Also, there’s a lot of fun to be had just playing over and over again with friends. The more friends you have, the more fun you can expect. This is a simple adage, but it applies very well to this type of game. The more, the merrier. If there is one glaring issue with this game, it is the occasional boss fight or overwhelming amount of enemies that will swarm and drop a solo player. There aren’t a series of instant death traps or anything like that as this is, after all, an all-ages game. You will run into a lot of bosses that have large-scale, wide angle attacks that will stagger your character and cause them to be vulnerable to follow up attacks. The level-up system will increase your damage and health over time, and it tracks even if you don’t survive. If you do get stuck, you can grind against the minor enemies for a short time and level up, which should make the future encounters easier. This isn’t going to require an advanced degree in hand-eye coordination or the timing of games like Ninja Gaiden, but it still provides an enjoyable, occasionally difficult challenge. On the surface, there isn’t anything new in this game. Gamers have seen almost everything that this game offers before. Does that mean you shouldn’t pay attention to this title? Not at all. Between the clever visual jokes and the ton of fun weaponry, Pirates Plundarrr does a lot of service to its subject material. There are four categories of weapons, and they range from the expected to the hilarious. The Sword category, for instance, covers everything from a simple cutlass all the way to the dual swordfish. Yes, a pair of fish are the top weapon in the category. The Clubs category includes giant hams as an option. There are also a few instances where you can ride the angry boars that these hams probably came from. Between the ease of the game and the desire to see what happens next, you’ll have a hard time putting this game down. Again, simplicity proves to be a winning strategy. Boomzap makes it easy to choose from several new weapons each level for your pirate, and you’ll want to experiment to find out what the best one on offer is. Even choosing different environmental weapons kept me hooked. Do I want a lightning axe or a pair of flaming hatchets? Decisions like that keep your interest, and if you have a group of friends around to play with then you’ll have even more reason to keep going. If you remember what it was like dropping quarters into arcade units in the nineties, especially when you had a “just one more boss” mentality, then you know what to expect here. There’s a lot of hooks in this game, even the ones not at the end of someone’s arm. Pirates are one of the basic cool groups these days, right up there with robots, ninjas, and zombies. You can blame Pirates of the Caribbean for this if you can’t stand it anymore, but I think its fun. The charming rogue archetype that Johnny Depp immortalized has kids running around asking where the rum has gone and saying things like “savvy?” Unless you hate pirates Majesco has embraced the concept. Even if you took the pirate theme out of this game, you’d still have a quality brawling game on your hands. The combat is simple to learn but easy to master, the graphics are all very well done, and the game is appropriate for all ages. You can play this with your kids, you can play it with your friends, or you can play it with your parents. Or, of course, some mix of those. The game isn’t so difficult that players at the awesome end of the skill spectrum are going to have to babysit beginners. If your kids are clamoring for a Wii game that everyone can play at once, this is a perfect title. I already mentioned International Talk Like a Pirate Day earlier, but I want to come back to it for a second. You can Google the event if you don’t already know about it. Pirates Plundarrr has an option to use this feature. It’s a small touch, but a great one. Options changes into Rigging. Start turns into Set Sail. Loading even changes to Loadin’. Those simple changes show that a lot of care and fun was put into this game by the developers, and a lot of fun comes out for the players. 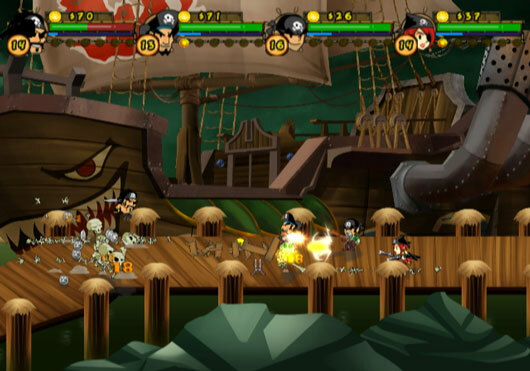 Pirates Plundarrr is a very entertaining beat-em-up game that focuses on four hilarious pirates and their quest to get back the treasure they are owed. 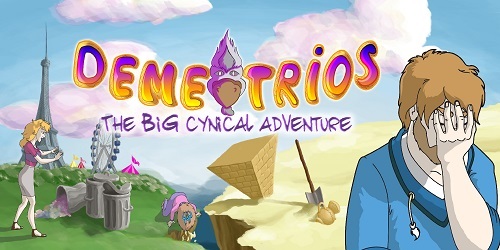 The premise isn’t exceedingly highbrow, but the game is about fun over flash. The graphics are all very sharp and wonderfully animated. The sound doesn’t dazzle with pirate voices, but the sound effects and music are all good. Control sometimes turns into a button masher frenzy, but there is some hidden depth and planning with a leveling-up system. The real joy of this game is how much it recreates the four-player arcade stand-ups of a bygone era. Grab yourself some chums, stick a controller in their hands, and take to the high seas for some engrossing action. Ya harrr!